Cepheus was the name given to a King of Aethiopia in Greek mythology. Cepheus was the husband of Cassiopeia, father of Andromeda, later, the father-in-law of Perseus. ​The ancestry of Cepheus is not entirely clear, although it is most commonly said that Cepheus was the son of Belus, king of the land then known as Libya (North Africa), and Anchinoe, the daughter of the Potamoi Nilus. If Cepheus was indeed son of Belus, then he was potentially brother to Aegyptus, the king who gave his name to Egypt; Danaus, the man from whom the Danaans descended; Phoenix, the eponym of Phoenicia; Agenor, father of Europa and Cadmus; and Phineus. Alternatively, Cepheus is sometimes called son of Phoenix, son of Belus or Agenor, in which case his only brother was Phineus. ​The land then known as Libya, was inherited by Danaus, whilst Aegyptus became ruler of Arabia, although there was subsequently trouble between these two brothers. At some point though Cepheus had departed from Libya, for he was named as King of Aethiopia. According to Heroditus, Aethiopia was the land found south of Egypt, giving rise to the notion that it was all of sub-Saharan Africa. This was a land of the unknown for whilst people travelled up the Nile to Nubia, few went further south. Cepheus would marry the beautiful Cassiopeia, a woman of unknown origin, and whilst some call her a nymph, it is more likely that she was simply a beautiful mortal. Cepheus would become father to one beautiful daughter, Andromeda, she who would be later be married to Perseus, but prior to this, Cepheus had announced that his daughter would marry Phineus, Cepheus’ brother. ​Cepheus indeed comes to prominence in the story of Perseus for Perseus would arrive in Aethiopia when Cepheus’ kingdom was in trouble; though the trouble was not Cepheus’ in the making. Cassiopeia was aware of just how beautiful she and her daughter were; and claimed that her own beauty, or that of Andromeda, surpassed that of the Nereids, the 50 nymph daughters of Nereus. Cassiopeia’s boast would reach the ears of the Nereids, and no god or goddess, even if minor ones in the Greek pantheon, would allow such hubris. The Nereids, who were part of the retinue of Poseidon, went to the Greek sea god to voice their displeasure. Listening to the Nereids’ complaints, Poseidon sent a flood to inundate the sea line of Aethiopia, and also sent a sea monster, the Aethiopian Cetus, to ravage the land. ​Cepheus would quickly travel to the Oasis of Siwa, to consult with the Oracle of Ammon, about how he might free his land of the troubles that had now befallen it. The news given to Cepheus though, was not pleasant, for the king of Aethiopia was told that only sacrificing his own daughter Andromeda to the Cetus would be sufficient to free his land. 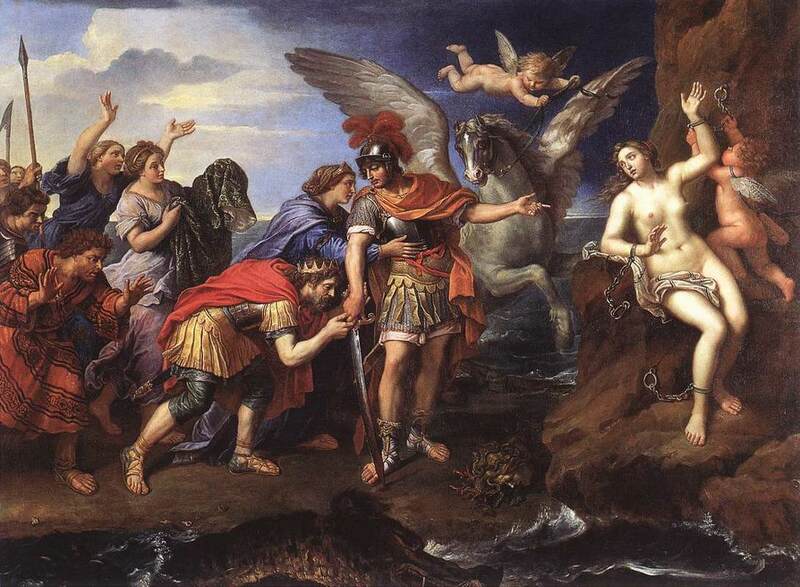 The clamouring of his people saw Cepheus forced to follow the instruction of the Oracle, and it was just after Andromeda had been chained to sea rocks, that Perseus flew overhead. ​Perseus of course killed the Aethiopian Cetus and rescued Andromeda, and as Perseus was being favoured by the gods, there was no further trouble sent down upon Aethiopia by Poseidon; and indeed, Cepheus, as a son of Belus was thus a grandson of the god in any case. A grateful Cepheus would then arrange for his daughter Andromeda to marry Perseus; the king of Aethiopia ignoring the fact that he had already promised his daughter to his brother Phineus. When Phineus complained, Cepheus pointed out that it was not Phineus who had saved Aethiopia or Andromeda from the Aethiopian Cetus. This caused Phineus to take matters into his own hands, but the brother of Cepheus would ultimately be turned into stone, when Perseus unleashed the gaze of Medusa upon him. Andromeda and Perseus would depart from Aethiopia for Seriphos, but only after many months had elapsed; and during this time, Andromeda gave birth to Perseus’ first son, Perses. As Cepheus was without a male heir, Perses was left in his grandfather’s care, and it was from Perses that the name of Persia came about, and all Persian kings, as they were descended from Perses, was thus descendants of Cepheus, King of Aethiopia, as well. Cepheus, by association with Perseus, would subsequently have his likeness placed amongst the stars as the constellation Cepheus, near to the other constellations of Perseus, Andromeda, Cassiopeia, and Cetus.